Festival Season Continues: Lord Balarama's Appearance Day! ~ The Toronto Hare Krishna Temple! Festival Season Continues: Lord Balarama's Appearance Day! Next week, Tuesday, August 20, 2013 marks the auspicious appearance day (birthday) of Lord Balarama, Lord Krishna's older brother! Lord Balarama symbolizes strength and compassion and we invite you to take part in the celebrations at the Hare Krishna Temple. The festival will kick off at 6pm with kirtan and will feature a special spiritual discourse on Lord Balarama by our visiting guest, HH Gopal Krsna Goswami. After the class, Toronto's Hare Krishna Temple will present the Fourth Annual Balarama's Bake-Off! Five members of our community have been selected and will be been assigned secret ingredients and have been challenged to come up creative sweet items related to Lord Balarama. After the class, the contestants will present their offerings in a fun and creative way. You won't want to miss it! Festivities will conclude with more kirtan and a huge vegetarian feast! 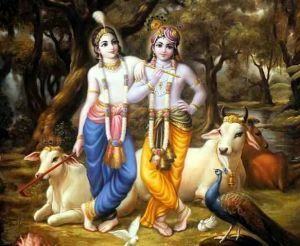 After Lord Balarama's Appearance day, the countdown to Sri Krishna Janmastami, the appearance of Lord Krishna, begins! This year, Janmastami falls on Wednesday, August 28, 2013. As always, this festival will be brimming with excitement as we celebrate the biggest birthday bashes of the year! More information will be posted shortly. We hope you and your family can join us next Tuesday for Lord Balarama's Appearance day! Please come dressed in blue to honour Lord Balarama!